Looking for a delicious eatery in Santa Fe? The Rio Chama restaurant features fantastic brunch, lunch, and dinner menus, as well as decadent desserts and dreamy cocktails. No matter what time of day you want a scrumptious meal, one is waiting for you at the Rio Chama restaurant. Known as the premier local steakhouse in the oldest neighborhood in Santa Fe, Rio Chama features a simple elegance in its natural classic ingredients. Discover more about why you need to eat at the Rio Chama restaurant during your stay at Four Kachinas! 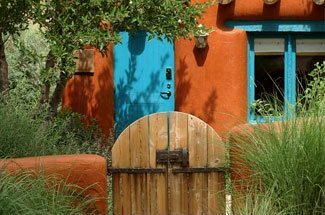 For more information on mouthwatering restaurants to indulge in during your stay in Santa Fe, download our free Vacation Guide. It features a variety of cuisines, so you can select which one you are in the mood for at the moment! And read about more restaurants we love here. Located just off the Santa Fe Plaza, just minutes away from Four Kachinas, the Rio Chama restaurant is a favorite eatery for both locals and visitors alike. Just past the unassuming entrance of the Old Santa Fe Trail, you’ll find a laid-back atmosphere and blend of intimate dining rooms, intimate patios, and a lively bar. Combining American cuisine with New Mexican influences, the Rio Chama restaurant serves prime rib, burgers, fondue, and more! If you’re staying at Four Kachinas over the weekend and are looking for some mid-morning food following your divine breakfast at the inn, consider brunch or lunch. You’ll love Huevos Rancheros and Blueberry Flapjacks or go for the Fish Tacos or Buffalo Burger. If you’re coming exclusively for lunch, start off with the Soup of the Moment and then dive into BBQ Back Ribs, Avocado and Grapefruit Salad, or the Griddled Country Club. Planning a date night out at the Plaza? Then, try dinner at the Rio Chama restaurant. You can savor a Fondue appetizer featuring six cheeses melted with wine and ale along with bread cubes, broccoli, and Granny Smith apples for dipping. Then, for an entree, delve into the Buttermilk Fried Chicken, Filet Mignon, or Pasta Primavera. One highlight at the Rio Chama restaurant is the popular bar. Discover a fine variety of wines, draught and bottled beer, select spirits, and cocktails. Try a local Rio Chama amber ale or IPA, made at a brewery here in New Mexico. Or, indulge in a handcrafted cocktail like the Chama mule with vodka, ginger beer, cucumber, and mint. The Huckleberry Lemonade is another favorite with flavored vodka and sparkling lemonade. Or, try the Chama Old-Fashioned with straight rye, bitters, muddled cherry, and orange. If you’re feeling a glass of bubbly, consider a refreshing champagne made here in New Mexico. Or, indulge in a variety of flavors from nearby Napa Valley and beyond. 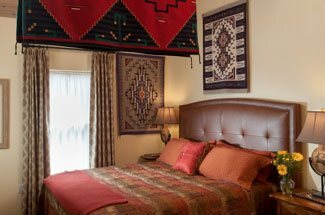 After a romantic date night out at Rio Chama with your special someone, retreat back to Four Kachinas for a quiet evening at our beautiful bed and breakfast. Sip on a glass of wine in our garden courtyard and then retire to your lovely room. You’ll love our unique guest rooms, each featuring local artwork and decor along with modern luxuries and amenities. Choose from a queen or king-sized suite, and spend a fantastic getaway with your significant other!